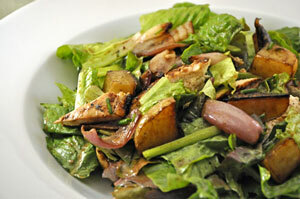 Easy Dinner from Thyme for Cooking: Salad with Grilled Chicken, Potatoes. I've served this salad a lot, always to rave reviews. If you add another chicken breast, a bit more potato, a few more shallots and a some more lettuce, it easily serves 4 for a light lunch... With a bit of bread and a nice dessert. And maybe a bottle of rosado? Sitting at a table on the terrace in the shade?